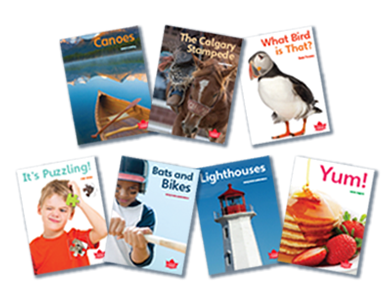 Build up the Canadian content in your classroom with books that highlight Canada from coast to coast to coast. Make the whimsy, variety, and beauty of our country come alive with material designed to meet the interests and reading needs of young children. Help children gain a sense of the diversity and richness of Canada as they explore the unusual, familiar, and extraordinary. Introduce Indigenous perspectives with content embedded throughout the series. This series is designed to offer readers colourful, exciting, and engaging books that highlight many aspects of Canada and the Canadian experience. Each set of ten books has been carefully developed to meet the interests and reading needs of young Canadian readers. They share glimpses of Canada from places, to animals, activities, and events. The whimsy, variety, and beauty of our country will come alive for the reader. Children will gain a sense of the diversity and richness of Canada as they explore the unusual, familiar, and extraordinary. These non-fiction books use vibrant photographs to explore topics of interest to young students. Each grade offers ten books. Within the set of ten are a variety of text forms. The text forms provide many chances for children to use a range of text features in natural and relevant ways as well as to practise the skills and strategies necessary for effective non-fiction reading. Celebrate Canada is a valuable supplementary resource that adds variety, richness, and Canadian content to a comprehensive literacy program. It helps teachers present appropriate literacy lessons while offering students chances to learn about and celebrate this country they call home.